The Honourable Suzanne Côté was appointed to the Supreme Court of Canada on December 1, 2014. Before her appointment to the Supreme Court of Canada, Justice Côté was a partner at Osler, Hoskin & Harcourt LLP, where she was head of the Montréal office’s litigation group. Before joining Osler, Hoskin & Harcourt, Justice Côté had practised for 23 years at Stikeman Elliott, where she was also head of the Montréal office’s litigation group. She specialized in complex civil and commercial litigation, including cases involving manufacturer’s liability, class actions, shareholder disputes and public law. Before she started working for major law firms, Justice Côté practised for approximately 8 years in the Gaspé Peninsula, where she had been born. Justice Côté received the Advocatus Emeritus distinction from the Barreau du Québec in 2011. In addition, she has been a Fellow of the American College of Trial Lawyers since 2005. 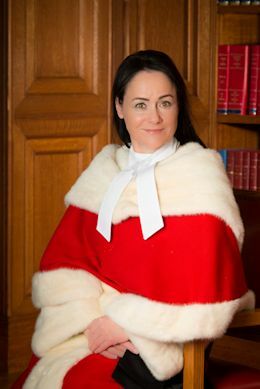 Justice Côté’s competence as a litigator was recognized on many occasions, including in the following publications: Best Lawyers in Canada (2014) — Corporate and Commercial Litigation and Class Action Litigation; Benchmark Litigation Canada (2014) — Litigation Star (Quebec); BTI Client Service All-Star (2011); The Lexpert/American Lawyer Guide to the Leading 500 Lawyers in Canada (2014) — Litigation - Corporate Commercial; The Lexpert Guide to the Leading Canada/US Cross-Border Litigation Lawyers in Canada (2012) — Corporate Commercial; The Canadian Legal Lexpert Directory (2014) — Litigation - Corporate Commercial (Most Frequently Recommended), Litigation - Directors’ and Officers’ Liability, Class Actions, Litigation - Public Law, Litigation - Securities; Lexpert Special Edition - Canada’s Leading Litigation Lawyers (2012); Chambers Global guide of the world’s leading business lawyers(2014) — Dispute Resolution (Quebec); Le monde juridique (2008) — named litigator of the year; and Lexpert (September 2003), in which Justice Côté was named in a feature article on Canada’s 25 best lawyers. Justice Côté argued cases in various trial courts, as well as in the Quebec Court of Appeal, the Federal Courts and the Supreme Court of Canada. She had received an LL.B. from Université Laval before being called to the Quebec Bar in 1981. Justice Côté has taught evidence and litigation at the École du Barreau du Québec, and has also lectured at the Université du Québec à Rimouski and at the Université de Montréal. She has also contributed for many years to the organization of the annual Coupe Guy-Guérin trial advocacy competition, a provincial competition that leads to participation in the Sopinka Cup. Finally, she has given many lectures relating to various areas of the law. Justice Côté has been a member of the board of directors of the Fondation Jean Duceppe and has also worked for years with the Canadian National Institute for the Blind. Originally from the Gaspésie, Justice Côté was a member of the board of directors of the Société d’histoire de la Gaspésie and president of both the Gaspé Chamber of Commerce and the Chambre de Commerce de la Gaspésie. Webcast of the ceremony in honour of the Honourable Suzanne Côté, held on February 10, 2015.